I’m well regarded by my friends as the ultimate selfie taker (just ask Shelby Teufel). The best piece of advice I can give – angle is everything. The higher, the better, and bonus points for creative cropping. 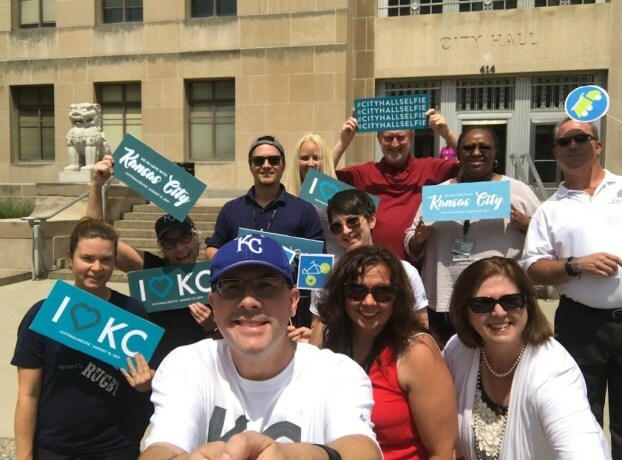 Although I hesitate to share my secrets since I will be actively defending my “Most Selfies in One Day” title on August 15, I do have a few tips for how to have a strong showing of your own on #cityhallselfie Day. Map your route. The key to my success in 2016 was taking the time to figure out the most efficient way to hit as many city halls as possible. Since I wasn’t sure how receptive my boss would be to all of this, I also scheduled a few meetings in key areas of town throughout the day to give me a good excuse to be out and about (#promove). Identify clusters of local government love. I work in the Kansas City metro and there just happens to be one stretch of road in that has eight city halls within eight miles. I’m sure there is a good case for consolidation here, but that’s a topic for another day. Embrace the crazy. I can only imagine how I looked to people inside the city halls I snapped shots in front of. I pulled up, ran from my car to wherever would be the most interesting shot (which included both standing in flower beds and balancing on fountains), took a handful of selfies, and then hit the road again. I was a little shocked by the number of front line local gov employees (police officers, maintenance workers, etc.) who stood and watched, but never asked what I was doing. I either looked like I knew what I was doing, or like a UFO sighting, the crazy happened in such a blur they didn’t exactly know what they had just witnessed. It’s about quantity not quality. My selfies from last year aren’t exactly the most flattering photos I’ve ever taken, but in this category, that’s not what’s important. As long as the photo has your face (or part of your face) and something that can be identified as a city hall behind you, you’re good to go. Don’t underestimate the power of a selfie. Six months after popping inside Merriam City Hall to say hi and get a tour instead of just awkwardly loitering outside snapping selfies, I was hired as the new assistant city administrator. It was a good reason to say hi to an old friend and meet a few members of the team. I’m not going to say I got the job because I made a selfie stop, but I certainly made an impression that day and Merriam employees still remember what I was doing the first time they met me. Although I am taking this show on the road on August 15, I will caution you that the City of Merriam has been planning for months and is ready to compete in a number of other categories on the big day. I love the conversation this started in our organization about fun ways we can engage with each other and our community to show our Merriam love, and look forward to adding a trophy (or two) to the shelf in 2017!